I stand amazed at the love, kindness, and generosity the universe bestowed on me this year. The victories were tremendous. Except for a few notable setbacks, I was watched over, cared for, and loved, unlike any other year in recent times. Given all that happened to me in 2015, I spent 2016 recovering and rebuilding my life. I am humbled at the way things came full circle this year, a very fitting culmination of the past two. I’m so grateful for the life. I will affirm, things are only getting started. When I look back on the memories, it’s hard not to write down a few of the favorite ones; women’s March in Manhattan, successful aneurysm repair surgery and six month follow up report, two 5k events for charity, first helicopter ride, started a business, invested in the stock market, visited three countries and 20+ cities, first book collaboration, acquired a platform to bring my message to the world, Jill Scott in concert, a new hobby (painting), Elephant Nature Park, live taping of a talk show, OWO, the stranger who paid my bill, mobster museum, Downton Abbey exhibition, Ancestry DNA, Magazine Contributing Writer, Suzy visiting, met Deon, ship inspection, Capitol Hill, and recently secured a new job, with an almost 50% increase in salary…… the list goes on. In a few short hours, a brand new year will be knocking on our doors. What are you most excited about? What plans do you have, that’s destined to set your soul on fire? I’m looking forward to projects already in the works, books to come forward, the first of many public speaking engagements, countries to visit, people to meet, and the love I will experience. Friends, if you only remember a few words from this post, please take with you the following; do not fear failure, but fear being in the same place next year, as you are now. Please know the best is yet to come. Don’t rely on anyone or anything to validate you. Finally, if you stumble (and we all do), make it a part of the dance. Wishing you and your loved ones, the very best 2018 has to offer! A week ago, I was saying teary goodbyes to a group of like-minded folks. We volunteered for a week, supporting a cause, greater than any of us. We cleaned elephant poo from their enclosures, built walkways, went on to cement our initials in the freshly poured concrete, bathe them (so much fun!) prepared food and fed them, unloaded multiple fruit trucks, collected firewood to build fires when they were cold, and cried while listening to the stories of their rescue. The week was topped off, when we sat in the presence of Pioneer and Elephant Whisperer, Lek, as she detailed the work she has been involved in. It was an emotional time; exchanging warm hugs, thank you’s, email addresses and phone numbers, vowing to see one another again in the coming years. We all recognized the path we had just traveled. No one wanted to leave. Our time at Elephant Nature Park had changed us, individually and collectively. When I told people I was embarking on a solo trip to Thailand, more than 8K miles away, to volunteer at an elephant sanctuary for a week, I got two distinct reactions; the looks of complete dismay and fear (their own), when they asked “You are going by yourself? !” “But why?” And of course, the free-spirited, open-minded ones who gleefully exclaimed: “Omg that is absolutely amazing! Safe travels, and take care of yourself!” I had always wanted to do a volunteer vacation, and after much research, and preparation, I found myself jetting off on the 32-hour journey to the mountains of Chiang Mai, in Northern Thailand. One of the self-discoveries I made earlier this year, is that Elephants are my spirit animal. My wish to get to know these gentle giants was fueled even more, when I came across a heated discussion on social media. Someone posted a photo of themselves riding an elephant, and the “PETA” folks came at her, hard. I decided to go to place where I could learn, grow, and help in this awareness. When you visit a circus, ride an elephant, see them painting or begging in the streets, you could never imagine the cruel process, they must endure, in order to be ready to for what you see. A little education. Not long after an elephant (in captivity) cow gives birth, the babies are taken away. The mother doesn’t get to raise them. Elephants are very sociable animals, and live in groups. They take care of one another; have excellent memories, and experience joy, sadness, and grief. They even cry real tears. Soon, the elephant must go through a week-long Phajan, aka, Elephant Crushing phase, which is intended to break its spirit, and eventually force it to do the will of the trainers. Babies have been known to step on their trunks, and kill themselves, as sometimes the treatment is too much for them. We watched five minutes of a heart wrenching documentary, and within seconds I was a puddle of mush. I will update the post, when I remember the name. I wept through the entire thing. An elephant can live up to 80-100 years old. They often have multiple owners, and will work for, five, six or more decades. 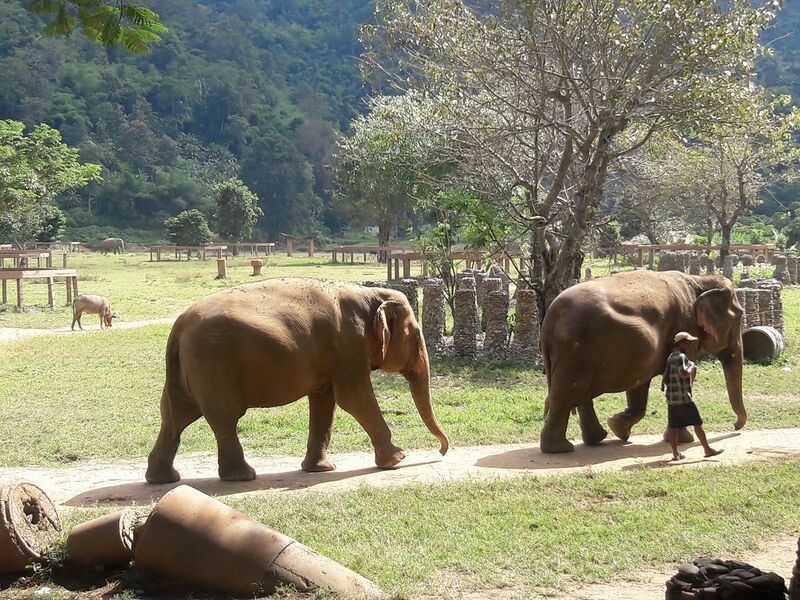 A lucky few are rescued by an organization like Elephant Nature Park. Lek, has been interviewed many times by major news networks, and received multiple awards for her work in their rescue and rehabilitation. The sanctuary allows them live the rest of their lives, free to wander, and do as they please. I spent a great deal of time researching the facility, as not all sanctuaries are created equal. Some still allow tourists to ride elephants, and other forms of industry. Elephant Nature Park is completely saddle off, and as of next year, tourists and volunteers will no longer be able to touch them. A fact which made the time there, even more memorable, to be a part of the last set of volunteers, allowed to intimately interact with them in this way. I cannot begin to encapsulate the emotions and experiences. Breakfast is at 7 every morning, and one day, I woke early to enjoy the last bit of sunrise. I sat down on the balcony to breathe in the fresh mountain air. Moments later, a few feet below, at least four elephants, and their mahouts strolled leisurely by. Where else could I go and have this type of heart stopping experience?! I will forever treasure my time and experiences there. I want to share a brief story of one of the “eles”, whose care I will be following, as her story affected me deeply. Her name is Dalah. She was rescued a few months ago, from an owner who force bred her, Basically, she was chained to was chained up, and bull elephants tried to get her pregnant. In the process, she suffered a dislocated elbow, torn ligaments, and was being treated for abscesses. The owners would finally agree to release her, but for a price. She now walks very slowly, with a noticeable limp, and uses her trunk to help take the pressure off her injured leg. The project was in the midst of building a therapy pool, to help with her recovery. Derek, Lek’s husband, was guarded, when our group asked if she was going to make it. We all hoped she did. She was on large daily doses of Tramadol, light therapy, and massages. She spent most of her time in the enclosure to prevent her injuries from getting worse. Dipor, another elephant and friend, visits her very often, to check on her well-being. The park suspected she might pregnant, but it couldn’t be confirmed for a little while longer. All in all, she was holding on, despite everything. I remember whispering to this beautiful creature, the words” I’m so sorry”. She had every reason not to trust humans, but she remains as loving as ever. Nothing could have prepared me for this most beautiful of experiences. I went in with no expectations or preconceptions. A week later, I left with phenomenal new friends, a humbled heart, and a profound sense of gratitude for what I witnessed, and been a part of. Furthermore, my hope was renewed by the people working hard every single day, to give rescued elephants, the life they should be living. Despite, the cruelties they have suffered, some do live the rest of their lives in peace. So what can we do? Well, if you love animals, please do not support this type of industry. Once the need for riding, painting, street begging etc is no longer paid for by tourists, then the industry eventually go out of practice. I understand people must make a living, and in their minds, feeding their families comes first. However, they existed before this practice. Education is the key here. Through Lek, many businesses are slowly turning huge corners. However, there is so much work to be done. If you are not moved by anything in this post, then seek that which sets your soul on fire! Come next year, I will be back into the volunteer vacation habit. Mama Africa has been calling my name for a very long time, it’s about time I answered. I sincerely hope you make the most of what’s left of 2017. 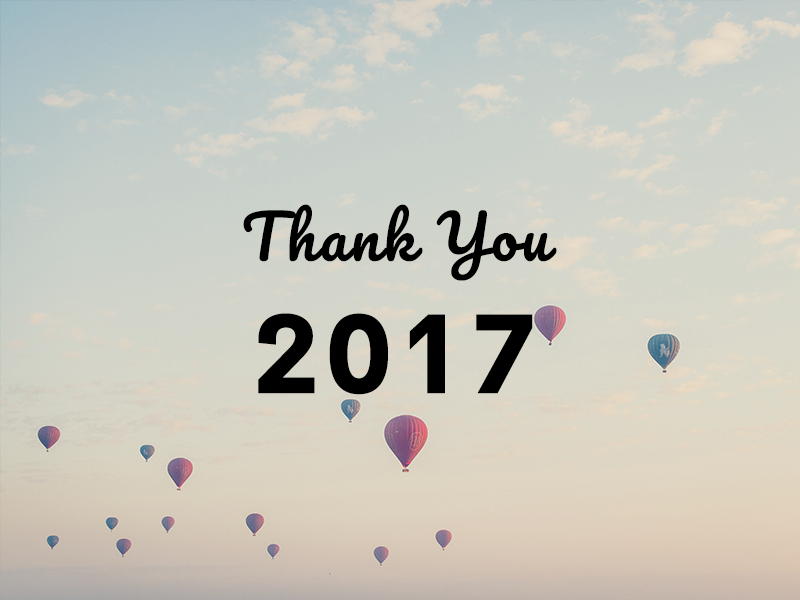 This past year has been so favorable and kind to me, it has succeeded in wiping out a disastrous 2016. Euphoric feelings have often enveloped my entire being, as an abundant universe reminded me, that I am loved and worthy. True happiness can only come from within. I know the reasons behind my smile. I’m putting the finishing touches to several noteworthy projects, due to be released next year, and couldn’t be more excited!